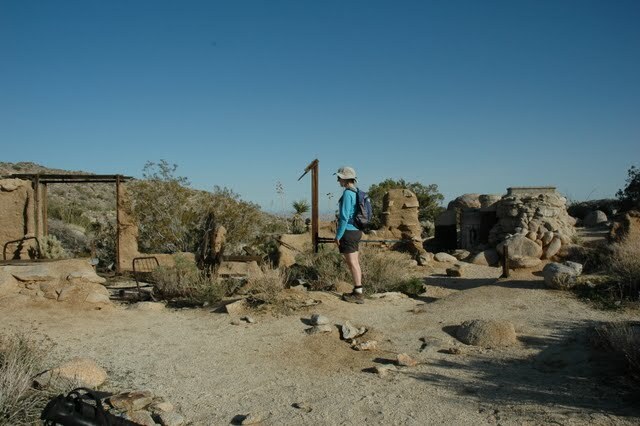 Anza-Borrego Desert State Park is the largest state park in California. 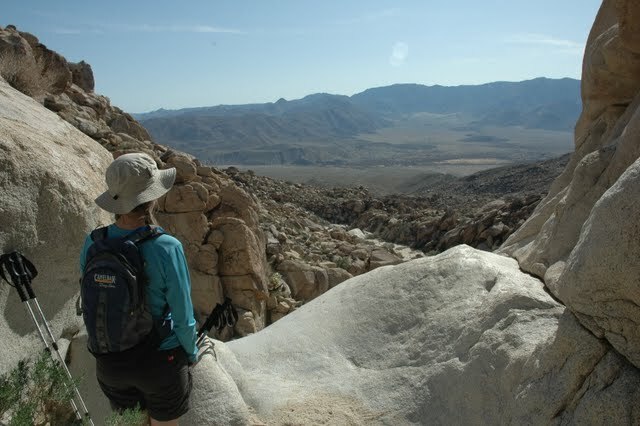 Five-hundred miles of dirt roads, 12 wilderness areas and miles of hiking trails provide visitors with an unparalleled opportunity to experience the wonders of the California Desert. 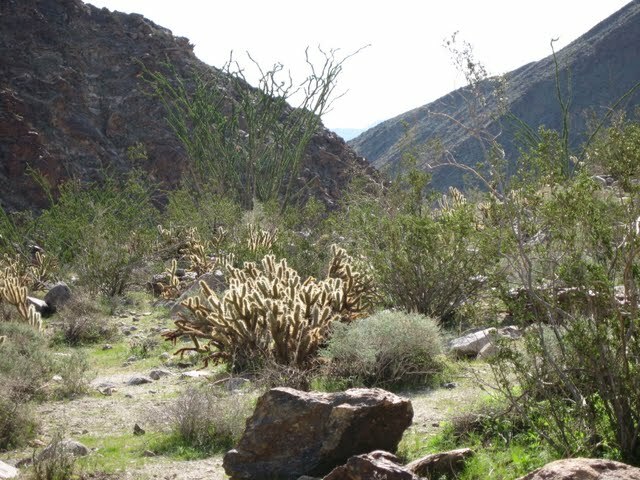 The park is named after Spanish explorer Juan Bautista de Anza and the Spanish name borrego, or bighorn sheep. 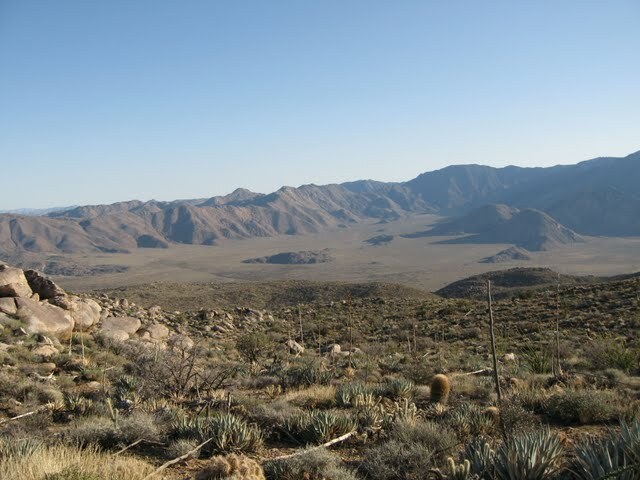 The park features washes, wild flowers, palm groves, cacti and sweeping vistas. 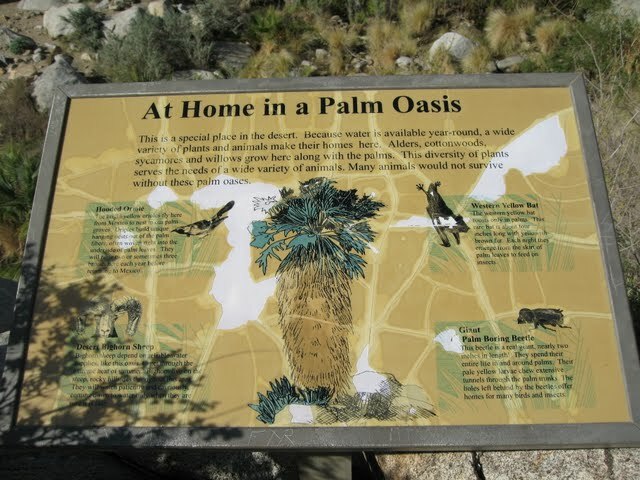 Visitors may also have the chance to see roadrunner, golden eagles, kit foxes, mule deer and bighorn sheep as well as iguanas, chuckwallas and the red diamond rattlesnake. 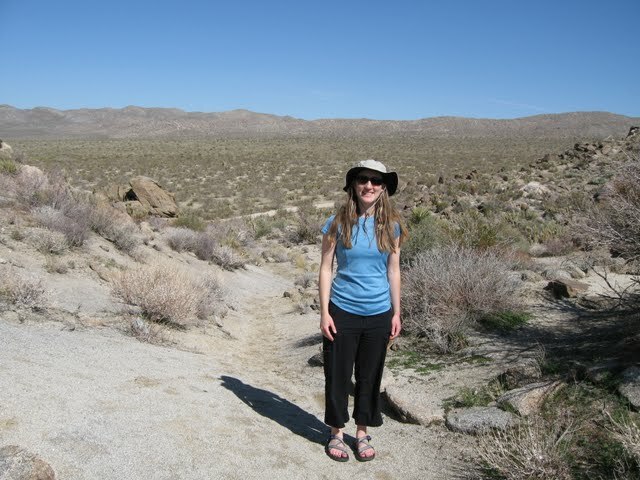 President’s Day weekend was the start of our trip to Anza Borrego. I woke up early at my brother’s place and met up with Diana around 9AM. I helped her pack up her gear, food, and clothes. The food was the longest part because she was teaching me how to prepare a meal called “Hobo Dinners.” I had never heard of such a thing, but it was really simple to do. She went to finish up a few last minute things while I prepared those meals. It was going to be our dinner that evening. Once sealed and wrapped in aluminum foil, the hobo dinners and Diana were ready to go. We made a last minute run to a nearby grocery store called Fresh & Easy. I bought our lunches and water for the weekend. 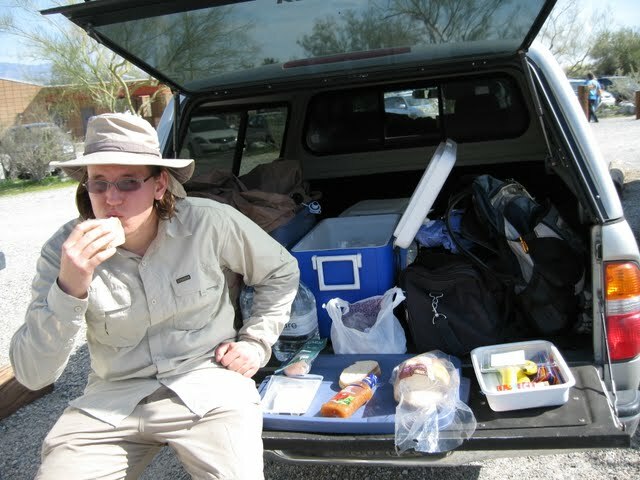 Now the truck’s ice chest was full, plenty of water to drink, and we were on our way. We stopped at an In-n-Out for a quick cheeseburger. 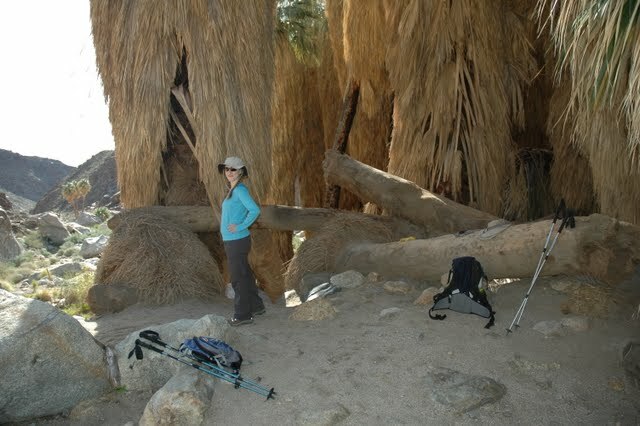 It was 11 AM and we needed to be at our campsite in Palm Canyon Campground by 2 PM. According to Google Maps it was supposed to be a 3 hour drive. We hit traffic on highway 91 eastbound. That delayed us for about an hour. It didn’t really bother either of us as we talked and looked around at the new scenery. 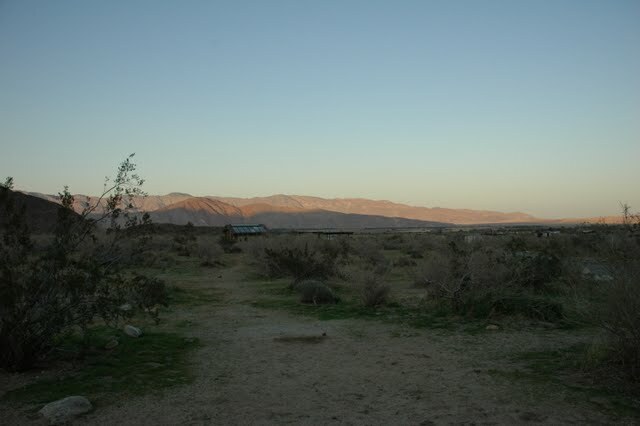 Once we hit interstate 15 southbound, it was an easy drive all the way to the campsite. Arriving at the campground around 3PM, we found our campsite for that evening. It was in a nice location with a great view. Since we couldn’t really hit any trails so late in the afternoon, Diana had a great idea. She mentioned visiting the Visitor Center and so we made our way over there. It was a small building full of volunteers. Apparently everything in the Visitor Center is run by volunteers. 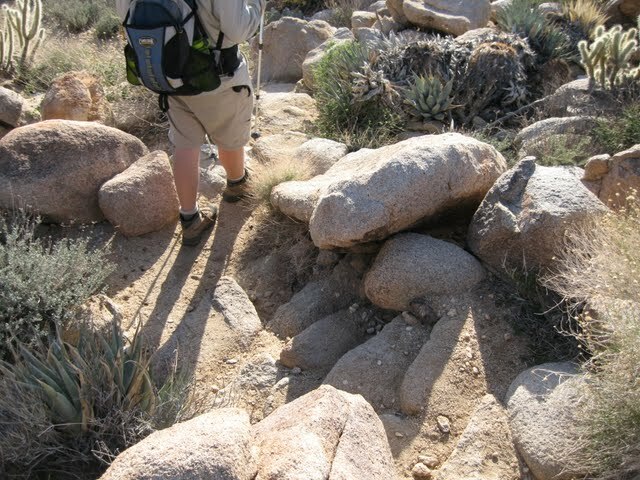 The trail system for the state park is maintained by volunteers. That is just amazing. 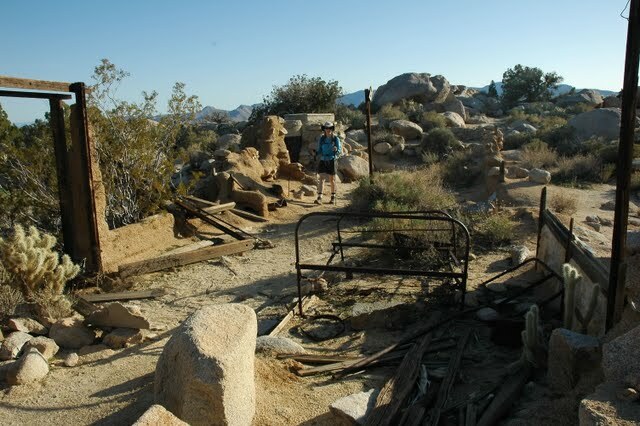 After spending a couple hours there and seeing their natural display of desert vegetation, we made it back to camp. It was time to cook dinner, so out came the two hobo dinners. It was my first time car camping in a long time, so I had a new stove to try out. 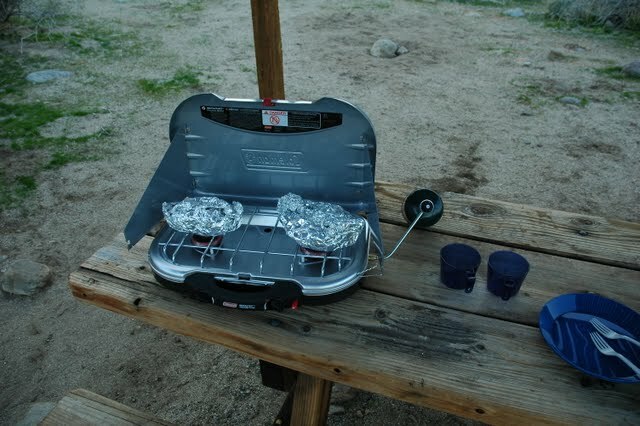 It worked great, and the hobo dinners were awesome! During the evening time, around 7:30 PM, we went to a presentation done by a State Park employee. The guy’s name was Josh, and he was part of the law enforcement. He did a quick slide show about what makes California so special, then quickly went into the “creepy crawlers” of the desert. 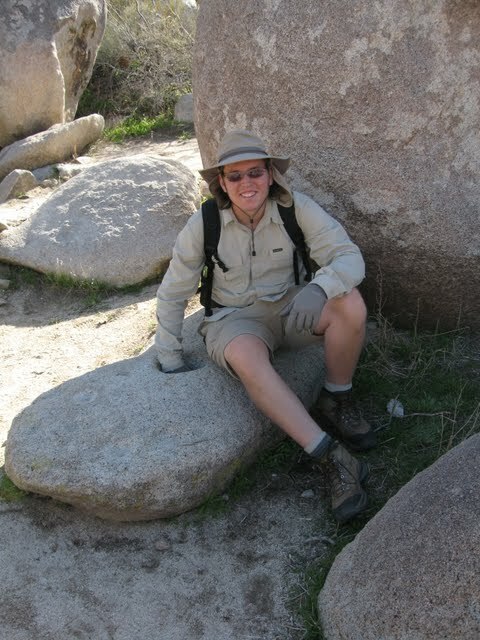 He taught the audience about scorpions, tarantulas, tarantula hawks, and more. 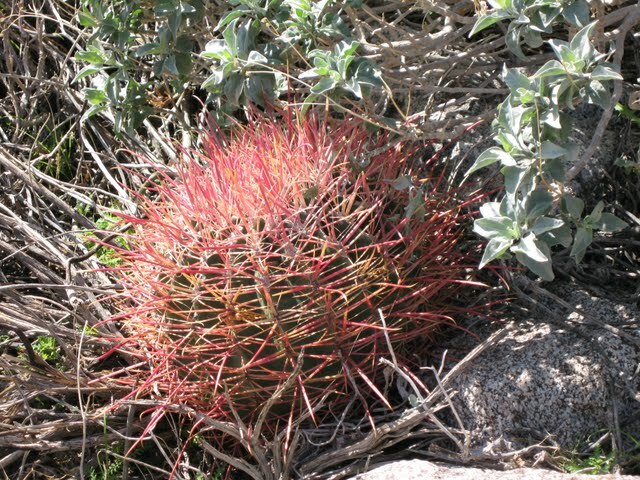 He said the desert comes alive at night, so pulling out his black light flashlight we followed to see what we could find. Unfortunately, it was still too cold in the evenings, so there wasn’t anything. Before calling it a night I pulled out my iPhone to check out the stars. It was a beautiful, moonless, clear night out. Mars was up high in the sky and Jupiter followed. We used an app called “Planets.” It worked perfect and showed us what constellations we were gazing at that night. 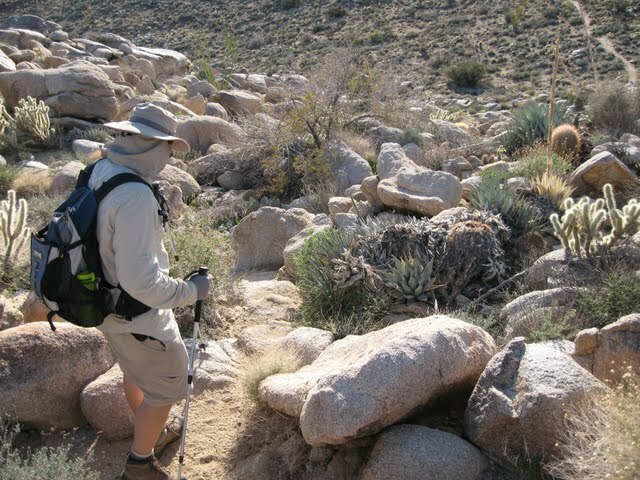 After a quick bite to eat and a little kitchen duty, we were on our first trail called Palm Canyon Trail at 8:15 AM. It was, as you may have guessed, right at our campsite. 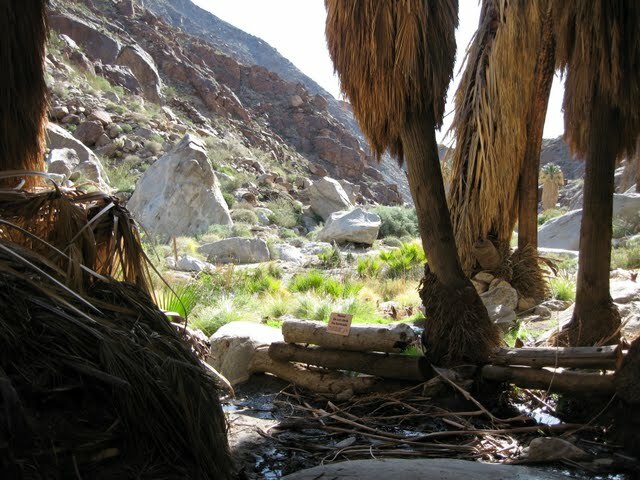 It meandered up a canyon to an oasis. 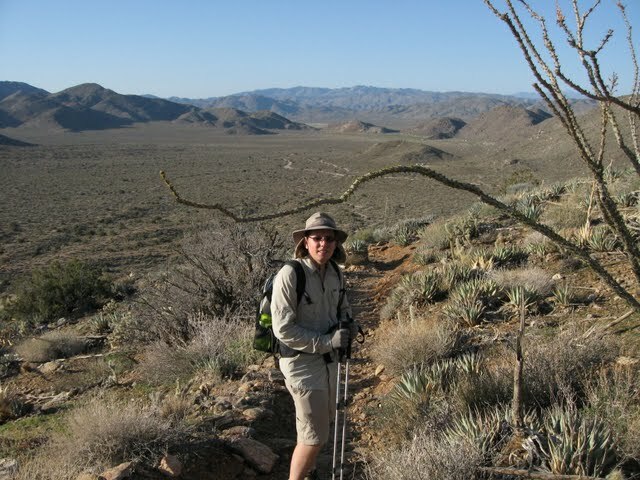 The trail was 3.5 miles round trip and with cool weather in the morning it was a great day to start a hike in the desert. We noticed all the debris from the 2004/2005 rain season. 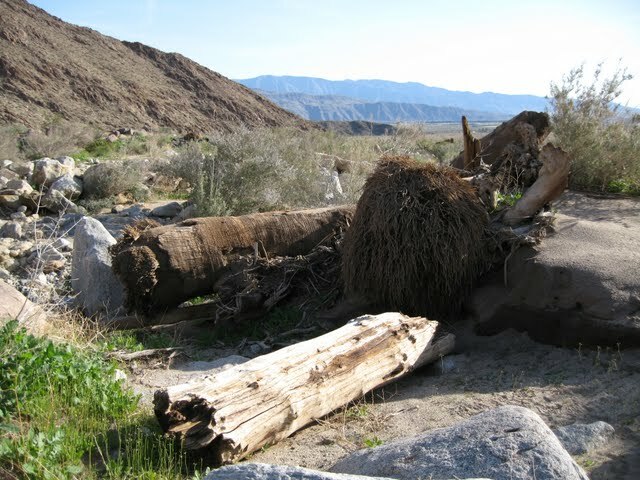 Apparently over 100 palm trees were blown out and the campground was also washed out in some areas with debris flows. Along the way we took photos. Diana had the Canon and I was using my Nikon. We both had fun snapping shots of the landscape. 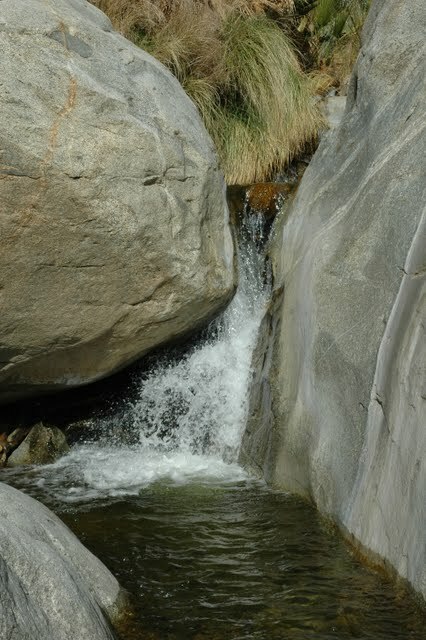 For such a dry area it was awesome to see riparian areas and flowing water. There was absolutely no shade along this trail when the sun was high enough. Around 9:30 AM we had reached our destination, and it was pretty cool. 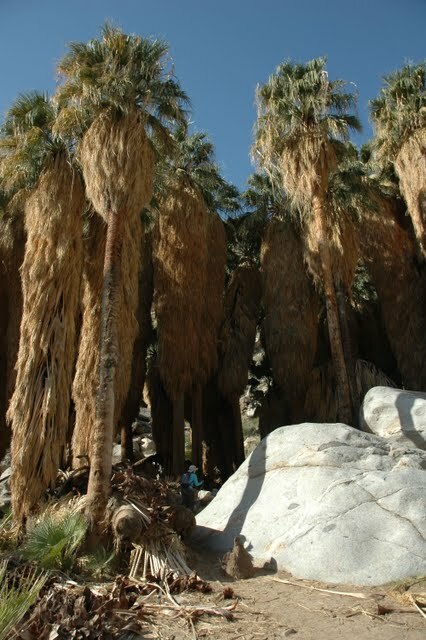 I could only imagine with all 100 palm trees what it must have looked like. Diana had been there once before several years back. She told me how it used to look and now it wasn’t as spectacular. I could only imagine. Our way back down was quick. We took a designated alternate route back home. 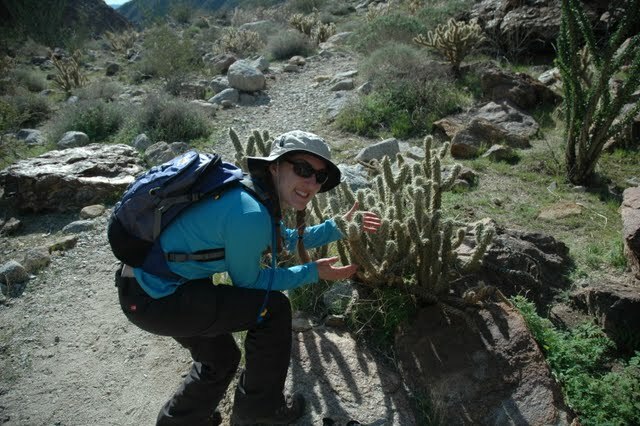 It was well worth it as we were able to see blooming Ocotillo, Barrel, Teddy Bear, and Diamond cacti everywhere. We enjoyed taking a few snap shots of those. Once back at camp, we had to pack everything up. Our next hiking area was a 45 minute drive. We also had a new campsite to come back to at night. 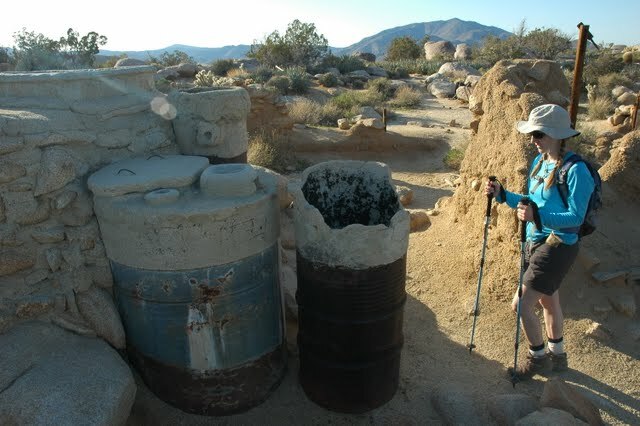 We stayed at site 117 that night and for Sunday it was 105. 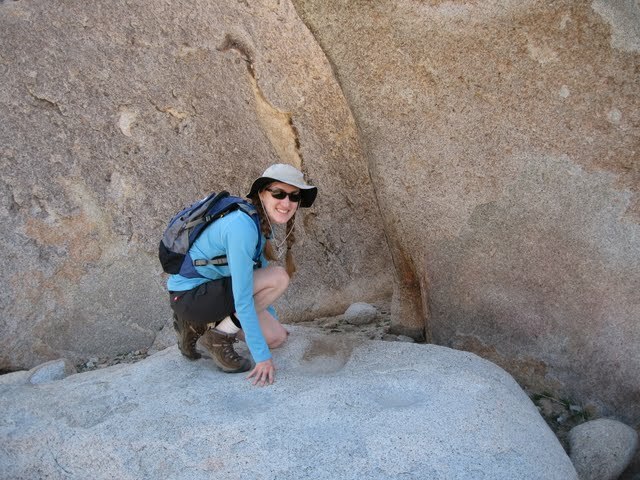 Anyway, we left again towards the visitor center to get some more information on trails. It was lunch time, so we made our lunches right there in the parking lot. Better to have the food in your system for 45 minutes and then start walking. It was very tasty – the enduring turkey sandwich (sourdough bread, swiss cheese, turkey, and Italian dressing). 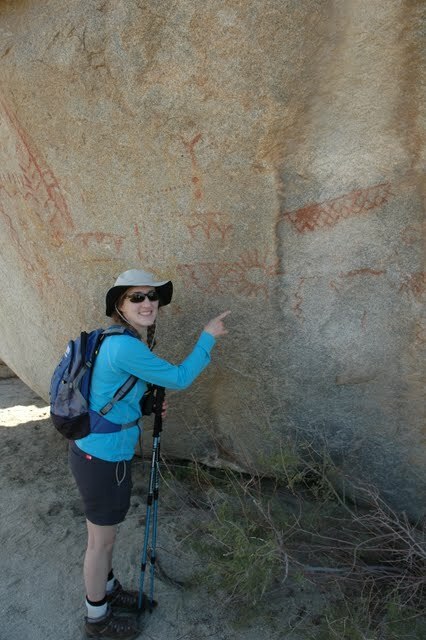 The second trail for the day was the Pictograph Trail. 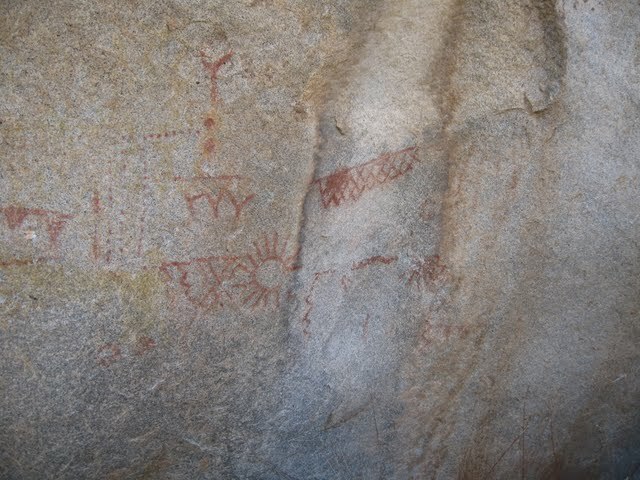 Apparently, though archeologists still don’t have any idea what it was for, Native Americans created some pictographs along the shaded side of a large boulder. 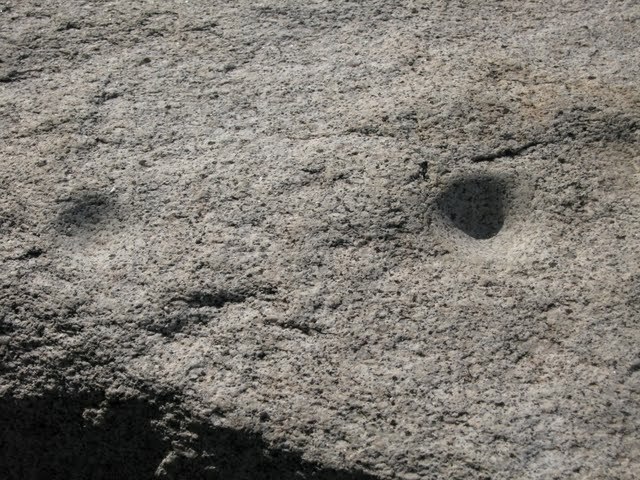 It was a very easy hike to get to these. 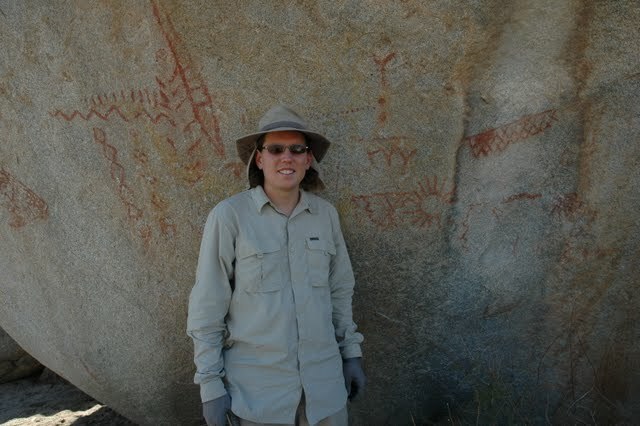 We decided to follow the advice from the Visitor Center and continue past the pictograph to an overlook of the valley. It was worth it. The third trail was a very fast walk. 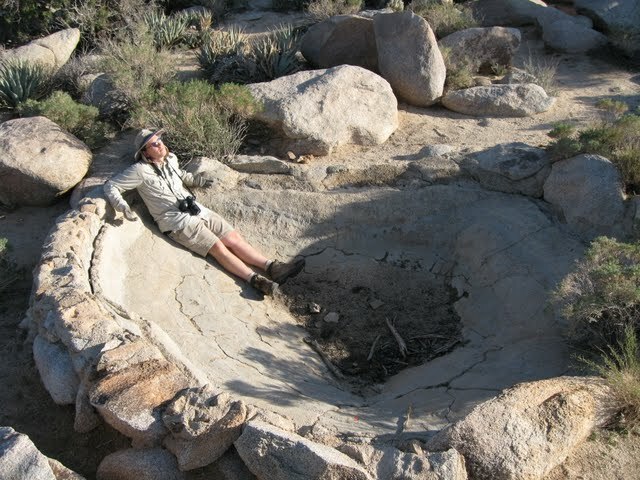 It was only 0.5 miles to the Moterros where natives would grind their collected food on slabs of rock. We took a few photos and made our way back. We were excited about the next trail. We had to be quick though, as it was getting later in the afternoon. Our final trail that day was called the Marshal South Trail. 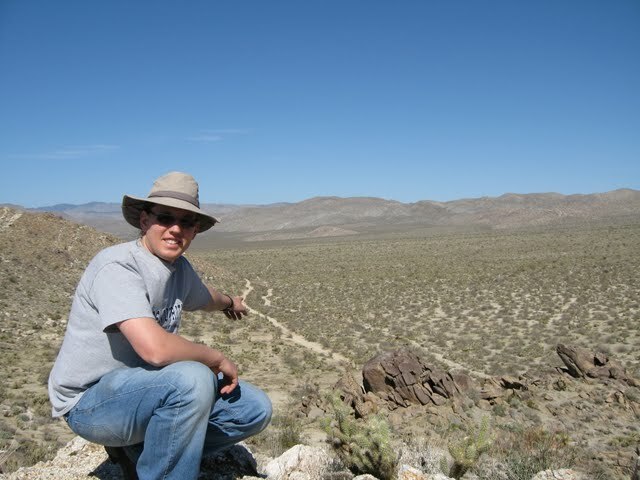 What a great 1 mile hike up the side of a ridge. 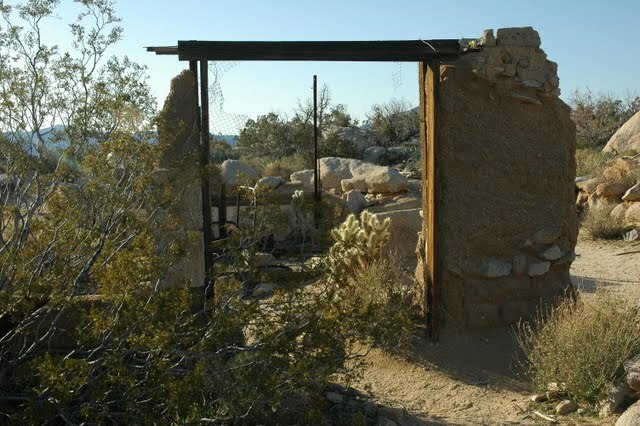 Now this site we were going to contained an adobe home built my Marshal South in the 1930’s. There is a lot of information about him, his wife, and three children raised there for 16 years. I won’t go into alot of details, but do a search on his name. Once at the top, we spent several minutes checking out the remaining structure. Apparently there was a water system, garden, and spa. Marshall even built steps out of the rocks to get to his place. Now it was time to go home. Making our way back, we took a few more photos of the area and left. It was a great day of hiking totaling 9 miles. There was other people on all of these trails. 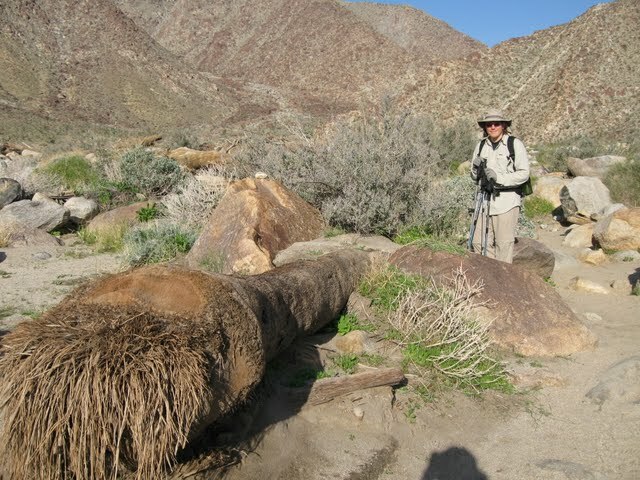 The Palm Canyon Trail was filled with people on our way back. The other three were not as busy, especially the Marshall South Trail. We took our time getting up in the morning. We were not planning on hitting a lot of trails on our last day there. Once we did get up, we ate breakfast, and cleaned camp. We left around mid morning and the weather was a lot warmer today. There was no cool morning temperature this time around. I found out it was supposed to be 80F that day! 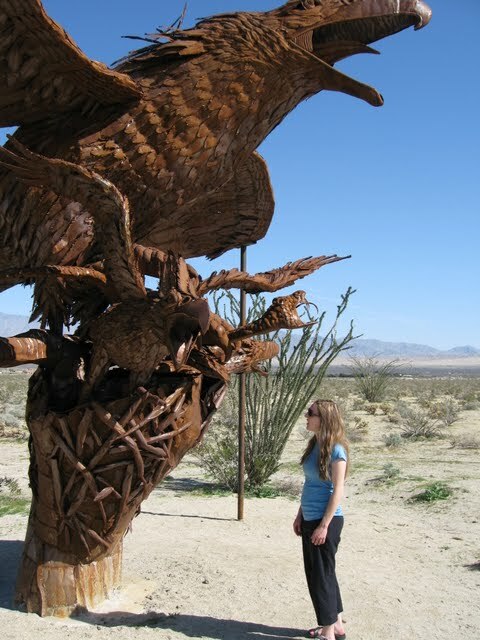 We did make a quick stop to check out these metal statues on the south side of Borrego Springs. 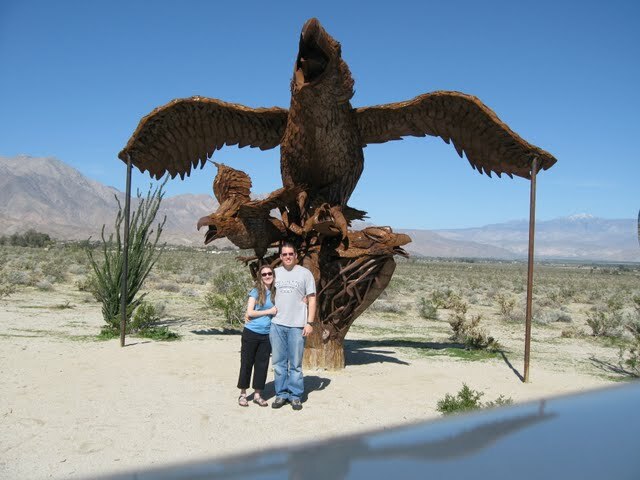 Leaving Borrego Springs we decided to take a different route home. Diana noticed we were right next to a historic trail yesterday and didn’t even know it. Pulling out our travel book we located it and were on our way. We made one final stop in Blare Valley to jump on a 0.2 miles trail. 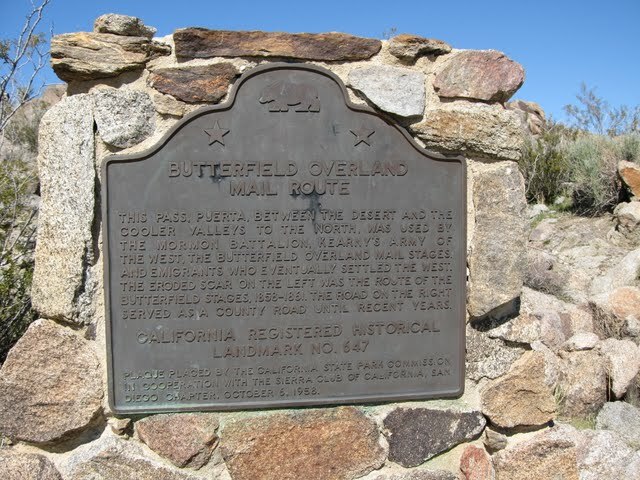 The trail was called the Butterfield Stage Coach trail. In the mid 1800’s this was used to bring mail into some of the towns out there. 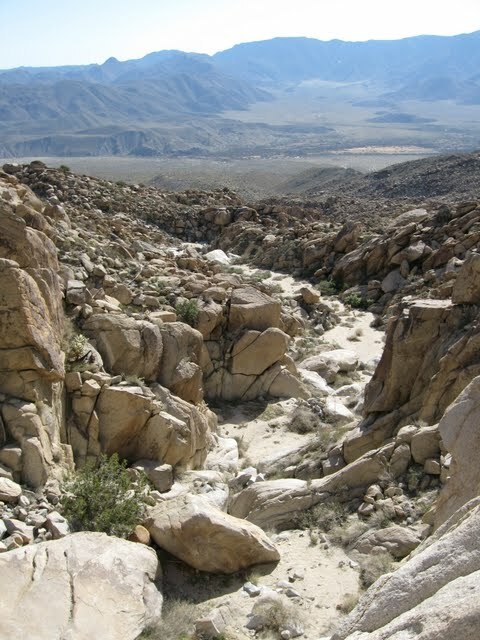 Another name for this trail was the Food and Walker Pass because people had to dismount their animals to get through here safely at the time. Out detour home took us to a town called Julian. It is a small mountain community that is famous for its apple pies. Naturally we stopped at a placed called Moms. They make the pies fresh and right in front of you. Besides getting desert, we also bought lunch there. Nothing like a good sandwich and apple pie on your plate! Then we bought some raw apple cider to take home. 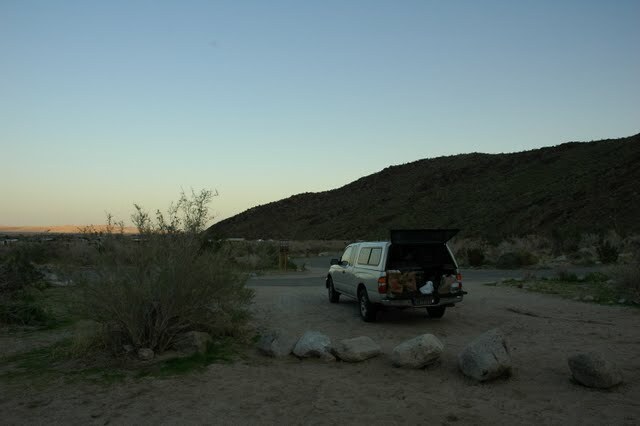 The rest of the time was driving and that concluded our weekend adventure in Anza Borrego. More photos can be viewed in the “Photography” section under “Photo Albums.” We took over 90 photos total and you can view them all online.